The sink is an essential and much-used kitchen item, but it doesn’t attract much attention. Not with gleaming bench tops, pretty tiles and clever appliances taking all the glory. But the tide could be turning for the overlooked sink, with plenty of options now available to pique people’s interest. White ceramic or porcelain sinks are still a beloved option for people wanting a traditional look, however. But While they are solid and non-porous, they can chip or scratch, which means repairs may be required. 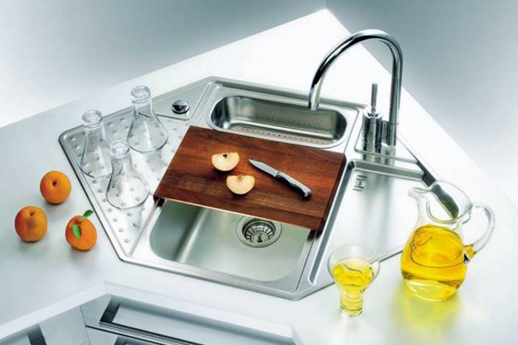 Acrylic is another option for sinks and it can be molded into any shape or formed in one piece as part of the benchtop. This gives a seamless finish. People like them for their clean look and because they have no gaps or joins where dirt can hide. Stainless steel is the least expensive material, it remains by far the most popular for plenty of other reasons too. Stainless steel doesn’t suffer from corrosion or extreme temperature changes, it’s durable and affordable. It’s almost impossible to hurt. And it’s available in a myriad of shapes, mounts, and configurations. 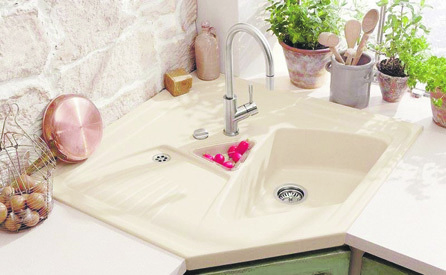 Top mounted sinks are standard, but under mounted styles give a clean modern line and a much easier surface to wipe.